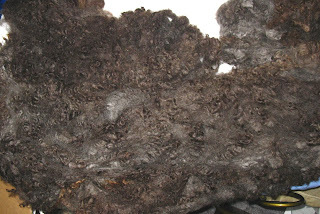 This is one of the fleeces I brought home with me from Oregon. Bought it from Anna Harvey of Harvey Farms (AKA, the Batt Lady). They raise Romney, Coopworth, Salish and Rambouillet sheep. This one is Coopworth. I had thought it was a dark grey, after I washed it I realized its actually a dark brown. It is super soft, almost 6 inches in staple length and has nice soft waving crimp. On the Etsy front, I've actually sold a few skeins! Well, ok so most of them were to people I know in Elko, but thats ok too! Remember to check back in to my Etsy shop occasionally as I will be posting new yarns every week. I just got this totally delectable bright yellow bamboo in that I started on right away, that should be up in the next couple days. I am hoping for TONS of sales for you! No one is going to find nicer homespun yarn anywhere, IMHO.